HandKey II is designed in order to bring maximal reliability. Every HandKey is a complete system capable of operating without any additional appliance. 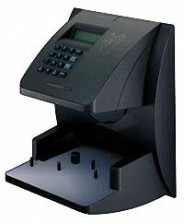 It incorporates circuits for lock operation, door status monitoring, memory for saving patterns and transactions and a processor processing authorization of access, thus securing a correct function even in case all communication with the superordinate computer is cut down. HandKey II can be used for small applications such as securing one door into the computing center as well as for large applications with hundreds of interconnected scanners. HandKeyII uses s special operation mode emulating card scanner – this enables an easy and quick integration into existing access control systems. A wide range of communication interfaces including modem and Ethernet module makes it possible to design a system according to the needs of the client. The HandNew software for Windows permits an unrestricted number of HandKey II scanners to be connected into the integrated access control system All transactions and alarms are transmitted in real time into the central computer where all access points can be monitored easily and effectively. At the same time you can set scanner configuration, backup patterns, create output sets, print them etc from the computer. An optional internal modem is used for data transfer form distant places. And with the Ethernet module the HandKey II can be connected into a regular computer network.